The Buzzer is CBC Sports' daily newsletter. Get up to speed in a hurry on the interesting stuff happening in sports, including another stunner by a teenage Canadian tennis player and what to watch this weekend. The Buzzer is the new email newsletter from CBC Sports. Subscribe here to get it delivered directly to your inbox every weekday. The 18-year-old tennis player has now beaten two former world No. 1s in as many days. Yesterday, she knocked off reigning Australian Open champion Caroline Wozniacki at a tournament in New Zealand. Today, she defeated seven-time Grand Slam singles champ Venus Williams. Andreescu is ranked 152nd in the world. Before this week, she had never even faced a top-10 player, much less beaten one. The Mississauga, Ont., native has played in only one Grand Slam match, losing in the first round at Wimbledon in 2017. She also defeated the world's No. 13 player that year but didn't do much in 2018. So how big are these upsets? They're great accomplishments for Andreescu, but let's take a harder look at them. Williams is an all-time great, but she's near the end of her career and has fallen to 39th in the world. Wozniacki is currently No. 3, so that win is more impressive. But this tournament is in the third tier of women's tennis events, with a relatively small purse. It's considered a tuneup for the Australian Open (the first Grand Slam of the season), which starts a week from Sunday. So it's hard to know who's giving their best effort and who isn't. Next up for Andreescu is a winnable semifinal match. She'll face Su-Wei Hsieh, the world's No. 28 player. This is Andreescu's first appearance in the semis on the WTA Tour, and if she wins she'll face either Julia Goerges (No. 14) or Viktoria Kuzmova (No. 50). If you're wondering why there aren't more highly ranked players, that's because two other Aussie Open warmup events are going on at the same time, and their purses are three and four times as large. It was all going so well for Elias Pettersson. Until it wasn't. Wednesday was a great day for the Vancouver Canucks' star rookie. He was named to the All-Star Game and scored his first NHL hat trick. Thursday was bad. Pettersson's leg got caught under a Montreal player and bent at a very scary-looking angle as they fell to the ice. He left the game and the team said there's no timetable yet for his return. We'll find out more when the results of today's MRI are revealed. DeMar DeRozan showed the Raptors he's doing just fine. Last night's highly anticipated showdown between two NBA stars who were traded for each other went all San Antonio's way. The home fans got to rain some cathartic boos on Kawhi Leonard, who was back for the first time since forcing his way out of town last summer. And their new guy, DeRozan, put up his first career triple-double (21 points, 14 rebounds, 11 assists) to lead the Spurs to an easy 125-107 win. Leonard at least got one nice moment when he hugged it out with his former coach Gregg Popovich after the game. Pop later suggested there are no hard feelings on his end. James Harden is on fire. After the Kawhi-DeMar game ended, basketball fans turned their attention to another grudge match between Houston and Golden State. Harden stole the show, dropping 44 points and hitting the game-winning three-pointer with two defenders all over him to give the Rockets a wild 135-134 overtime victory. The reigning MVP has scored at least 39 points in six straight games and Houston has snapped out of its slow start. We could be headed for a Rockets-Warriors rematch in the Western Conference final. 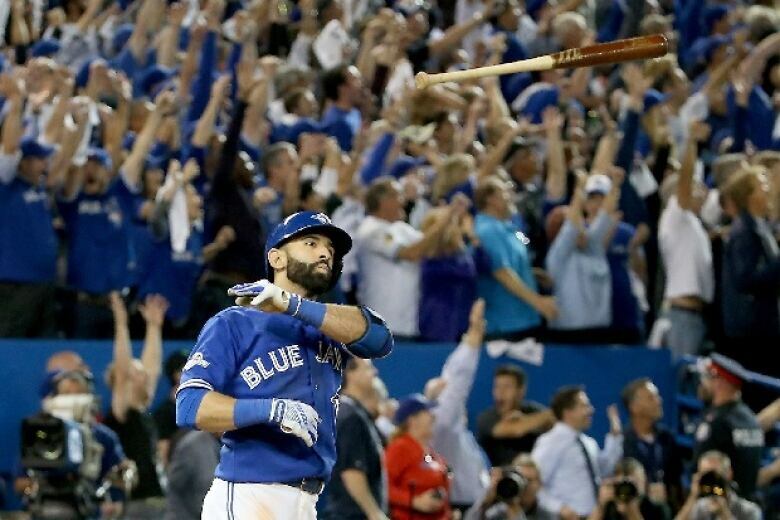 You can buy the Jose Bautista "bat flip" home run ball. That's the one the former Blue Jays slugger launched into the seats to push Toronto past Texas in the deciding game of their playoff series in 2015. Thanks partly to Bautista's epic celebration, it's probably the second-most famous homer in Jays history, behind Joe Carter's that won the '93 World Series. Lelands auction house is now selling the Bautista ball. The starting bid was $3,500 US but the auction is open for a month. Alpine skiing — World Cup women's slalom. With Lindsey Vonn saying she'll retire early next season, Mikaela Shiffrin will soon become the biggest star in skiing. The 23-year-old has a wide lead in the race to win her third consecutive overall title and is the youngest ever to reach 51 World Cup wins (Vonn is the all-time women's leader with 82). This is your chance to watch Shiffrin in her best event — she's won the slalom season title five times and took Olympic gold in 2014. Watch the two runs live on CBCSports.ca at 7 a.m. and 10 a.m. ET, or catch the best parts at 5 p.m. ET on CBC's Road to the Olympic Games show. NFL playoffs — Indianapolis at Houston (4:30 p.m. ET). The post-season kicks off with a too-close-to-call matchup of AFC South division rivals. Houston has an exciting quarterback-receiver combo in Deshaun Watson and DeAndre Hopkins. The latter will amaze you with his ability to catch any ball thrown anywhere near him. Indy is led by Andrew Luck, who has come back from a shoulder injury to remind us he's still one of the world's best QBs. NHL — Nashville at Montreal (7 p.m. ET). Anytime PK Subban is back in town, it's worth watching. This time, the former Hab will find his old team in a better place. Montreal is surprisingly just one point behind Nashville, which is again considered a Stanley Cup contender. NFL playoffs — Seattle at Dallas (8:15 p.m. ET). The Cowboys are slight favourites after winning seven of their last eight games to turn their season around. Their offence lacks imagination but it's looked a lot better since the mid-season acquisition of receiver Amari Cooper. Ezekiel Elliott is one of the best running backs in the game. Defence, though, is Dallas' real strength. Rookie linebacker Leighton Vander Esch makes tackles all over the field and DeMarcus Lawrence is an explosive pass rusher. NBA — Toronto at Milwaukee (8:30 p.m. ET). For the Raptors, this is the opener of a back-to-back against top Eastern Conference teams. On Sunday night they'll face Indiana, but this one is more interesting because the Bucks have the NBA's best record and an MVP favourite in Giannis Antetokounmpo. He's one of a kind — a man that big just should not be able to move like that. NFL playoffs — L.A. Chargers at Baltimore (1 p.m. ET). Poor L.A. They went 12-4 but, because Kansas City won their division, they have to go on the road to face a 10-6 Baltimore team that beat them in California two weeks ago. Rookie QB Lamar Jackson has injected new life into the Ravens with his ability to both run and pass, and the Baltimore defence is one of the best in football. But the Chargers can attack it through the air with MVP-calibre QB Philip Rivers and on the ground with running back Melvin Gordon. The Ravens are favoured by just under a field goal. NFL playoffs — Philadelphia at Chicago (4:30 p.m. ET). Only a few weeks ago, Philly seemed doomed to follow its Super Bowl victory by missing the playoffs. Then the Eagles won their last three after Nick Foles replaced an injured Carson Wentz at QB — eerily similar to last year's script. But the backup now faces a tough matchup on the road against the NFL's best defence. Star pass rusher Khalil Mack figures to be in his face all day, and the Bears' secondary will be waiting to snag any bad throws. Chicago is favoured by almost a touchdown — easily the biggest spread of this round. You're up to speed. Get The Buzzer delivered to your inbox every weekday by signing up here. Got an idea, question, comment or other feedback on the newsletter? A hot sports take you want to share? Drop us a line at thebuzzer@cbc.ca.